A Self-Help Guide--with Jazz Hands! 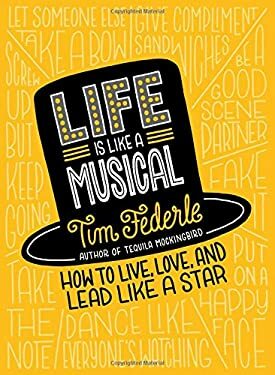 Life is Like a Musical features 50 wry, witty tips on getting ahead in life and love--all learned in the showbiz trenches. "Hilarious, wise, and one-of-a-kind. This book is so damn brilliant I'm surprised it didn't already exist." -- Sarah Knight, bestselling author of The Life-Changing Magic of Not Giving a F*ck Before Tim Federle became a bestselling author and a Broadway playwright, he worked as a back-up dancer at the Super Bowl, a polar bear at Radio City, and a card-carrying chorus boy on Broadway. Life is Life a Musical features 50 tips learned backstage, onstage, and in between gigs, with chapters such as "Dance Like Everyone's Watching" and "Save the Drama for the Stage." This charming and clever guide will appeal to all ages and inspire readers to step into the lead role of their own life, even if they're not a recovering theater major.